Four-time champion Sebastian Vettel passes Sergio Perez and his Mercedes-powered VJM10 Force India on his drive to a fourth-place finish. Perez held off Vettel for several laps. but the Ferrari driver was not to be denied. Feature | When Laurieanne and I decided to go visit friends in Mexico for El Día de los Muertos, we realized that the Mexican Formula One Grand Prix was going to be taking place while we were there. So there you have it; we’re going. I dutifully sent away for press credentials but was shunned by the big-time high graders that run the F1 circus. So since I was going anyway, I gave myself the assignment to come up with a relevant group of photos that show the experience of being a fan and spectator at an F1 race. Took me most of the year to save up for the tickets. Yes, it’s that expensive. I don’t care, I’m a fan and student of the sport and we’re going. Our friend and race driver Santiago De Rivas, who lives in Mexico City graciously took care of all the arrangements. Even to the point of taking care of the difficult issue of transportation to and from the track. Not a minor thing in a city with insane traffic issues. He was a tireless font of information on not just Mexican culture but the history of the Mexican Grand Prix. The race was held at the Circuito Hermanos Rodriguez, which is in the middle of the massive, traffic-choked, utterly amazing megalopolis of 25 million-some-odd people that is Mexico City. The race would be the third to the last race of the season. The 2017 championship has been a ding-dong battle between Lewis Hamilton, 32; and Sebastian Vettel, 30; the top drivers of the Mercedes and Ferrari teams, respectively. Max Verstappen (Red Bull Renault), Valtteri Bottas (Mercedes) and to a lesser extent Kimi Raikkonen (Ferrari) have also figured into the mix, but for the last few years it has been the Vettel and Hamilton rivalry that has fueled the series. Vettel has four championships to his name and Hamilton three. Early race action coming out of turn 5. McLaren, Haas and Sauber drivers mix it up. Hamilton, a flashy Brit in the James Hunt model who likes a party, rocks huge diamond earrings and hangs out with celebs, is contrasted by Vettel, a more sober German in the Niki Lauda mode who displays a regrettable touch of arrogance now and then. Sort of the yin and yang of the series. It is hard to tell if there is a real rivalry. I can’t seem to remember either of them saying anything truly nasty about the other. They both freely give each other respect, but there is cold determination in both of them to win. About a third to half of the crowd were sporting Ferrari gear, either a hat or, in many cases, full team outfits. In a town where most of the roads are wildly inappropriate, and would even be dangerous, for a Ferrari, a car far beyond the economic reach of the vast majority of people, the Scuderia has huge brand appeal. A Ferrari is an aspirational vehicle representing success and glamour. Ferrari is everyone’s idea of what a race car is, and they want to be wearing the gear. Which is a real tribute to the cultural significance of the Italian niche car company from Modena. But it wasn’t just Ferrari; there were grownups and a lot of children in the full team gear of Red Bull Racing and Petronas Mercedes as well. The fans in Mexico love racing, they know what is going on in the championship and they support. A young fan shows off his true colors. There are two races in a Formula One weekend. The first is qualification, which is taken in three stages. They gradually winnow the drivers down until the top 10 drivers shoot it out for the first 10 positions. The driver with the fastest time gets on the pole. After the dust settled it was Vettel, Verstappen, Hamilton, Bottas, Raikkonen and Esteban Ocon in that order. All separated by roughly a second. This is a competition of hundredths of a second. Lewis Hamilton came 9th and clinched his fourth championship with two races to go. He is the most successful British driver in Formula One. Ferrari had high hopes for a win when Sebastian Vettel put his car in pole position. But after a first lap collision Vettel had to hustle to finish fourth. The many little aero devices and wings funnel air around the car. Note how high the radiators have moved to catch air coming over the wheels. The flat carbon fiber floor extends almost to the outer edge of the wheels for high downforce. Kevin Magnussen and the American Haas team struggled at the back of the pack. The team has a massive growth curve ahead if it is to be competitive. Sergio "Checo" Perez Waves to the crowd after qualifying. 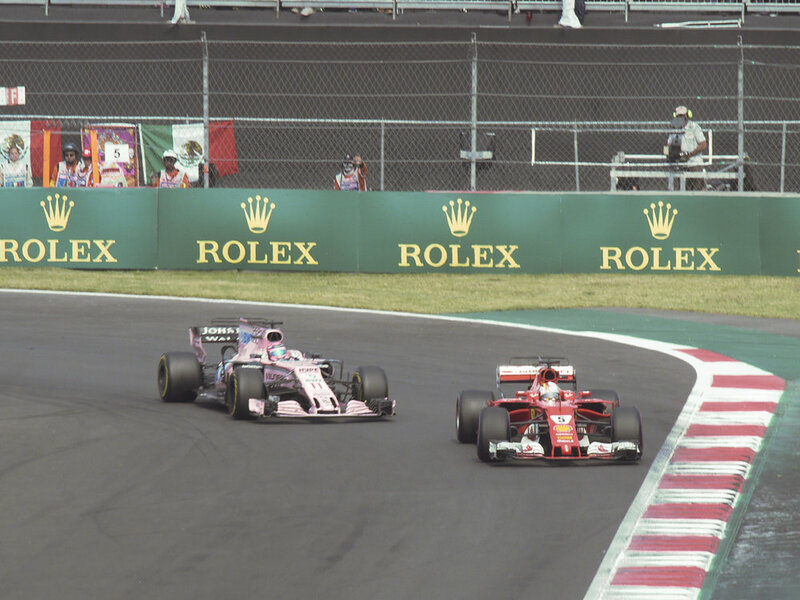 Coming into the race, Hamilton was leading Vettel in points, and a fifth-place finish or better would clinch the championship for him if Vettel won the race. At the start of the race they got into each other in turns one and two. Vettel damaged his front wing and Hamilton punctured a tire. Both immediately pitted and by the time they came out of the pits they were in last place. Vettel began a fantastic drive through the field that ultimately took him to fourth place by the end of the race. Hamilton appeared to have given up and drove lackadaisically through the tail-enders. Ultimately, after a fierce battle, he passed former world champion Fernando Alonso for 9th place in the closing laps. The Mexican fans were especially excited about, and are deservedly proud of, Sergio “Checo” Perez, who drives for the Force India team. Force India started as an also-ran but has moved up into solid finishes in the top third of the field using Mercedes engines. The crowd went crazy every time he came round past the grandstands in his pink car. And he rewarded them by putting in a respectable drive. On the 19th lap, an amazing and inspirational thing took place in the stands. The whole crowd stood up and raised their fists in silence as a gesture of respect and remembrance for the victims of the earthquakes that had struck Sept. 19, 2017. The raised fist was used to get silence for rescuers looking for victims in collapsed buildings. As Vettel cut through the field, he inevitably came upon Checo Perez. 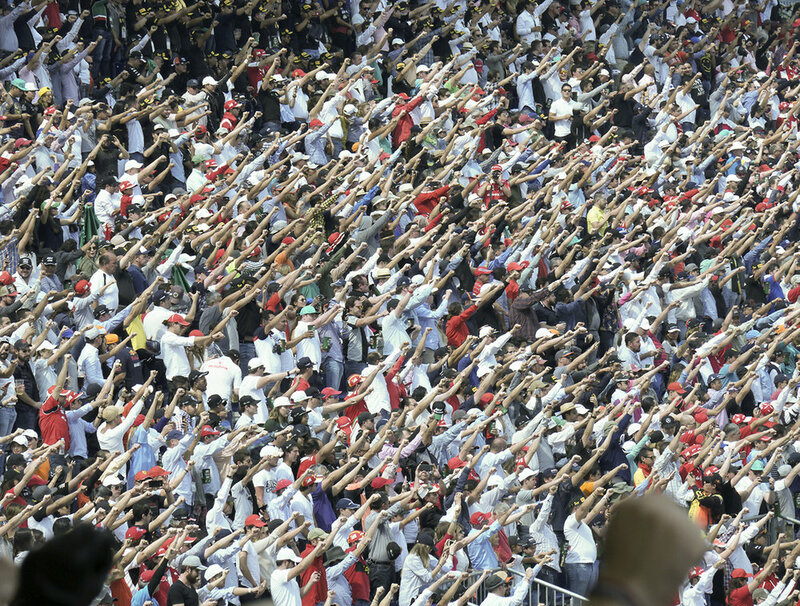 It was interesting watching 100,000-plus deeply conflicted Mexican fans as Vettel stalked the pride of the nation. Despite the popularity of Perez, the crowd roared when Vettel passed him in turn four. Fans the world over love a front runner no matter national pride, and hey, it is Ferrari. No fighter jets at this race, but a Mexican army helicopter did fly around a huge flag. As it turned out, after doing the math, the Mercedes team told Hamilton that he only had to get into the points (tenth place or better) to clinch the title. Meanwhile in the Ferrari pits the team was frantically urging Vettel on, hoping he could get to the front. They reportedly even considered bringing in Raikkonen for an unneeded pit stop toward the end to allow Vettel to get past him for third place. But it was not to be. Hamilton protected his car without taking any chances. He did what he needed to do and clinched his fourth world championship. This makes him the most successful British driver in the history of Formula One. Almost lost in this drama was the amazing drive Max Verstappen put in to win the race. The 20-year-old Belgian lapped all cars up to fourth place. It was that good a drive. Hamilton’s teammate Bottas cruised to second with Raikkonen sailing along to third place. And that was the race. As Hamilton spun victory doughnuts in the stadium section to wild applause, Verstappen stood awkwardly by, the almost unnoticed winner. Oh, there were other entertainments as well. There was a Porsche Supercup race and a somewhat-parade race of vintage Formula One cars. In many respects the Porsche race featured the best racing of the weekend. Most of the field was close and there was a lot of passing and argy-bargy. Interestingly, the cars were louder than the F1 cars. Matt Campbell leads the field into turn 4 on his way to a win in the first of the weekend's two Porsche Supercup races. I love the Vintage F1 cars. They are raw and really dangerous and it takes someone with balls to drive one fast. Plus, the wide variety of body shapes and engines that modern F1 cars do not have is really interesting. It reminds you of a time when Formula One was much more interesting. Dangerous as hell but, like most very dangerous things, damn compelling. For those of you who have not been to an F1 race, there are two things that become very clear as soon as you walk through the gates. It is about advertising and about making money. Oh, also about stripping money, massive buckets of money, from the hyper-rich people and companies who participate in the competition. Teams participate for the competition but advertisers participate for the publicity and worldwide TV exposure that the races bring. It sometimes seems that the racing is almost an afterthought. Very popular Renault concept race car in the Fan Zone. There are the usual merch booths manned by comely lasses every 100 meters selling $75 hats and team gear. Masses of sellers hawking cerveza and papas (potato chips) roam the stands. But the fans love it, and heck, who doesn’t love beer and potato chips? It is instructional to know that the drivers get no prize money for winning a championship. It is the teams that get the payout at the end of the season. Don’t feel bad for the lads, though; they make out all right what with their salaries, bonuses and endorsements. And there are the considerable bragging rights that come with a championship. However, that does not diminish the content. Very often the racing is thrilling and quite impressive and the cars are insanely fast. The fastest speed of the weekend was set by Vettel at 362.4 KPH at the end of the main straight. These are arguably some of the best racing drivers in the world driving cars that represent the very tip of technological achievement. Every aspect of the cars and teams is hugely regulated by the French organization the FIA (Federation International de L’Automobile) which is the sanctioning body for Formula One and many other international racing series. Over the years the FIA has been dogged by allegations of rapacious greed, personal vendettas, favoritism and questionable ethics. The controversial longtime owner of F1, Bernie Ecclestone, recently sold the series to American consortium Liberty Media, headed by media mogul John Malone, for a reported $4.4 billion. This has made some of the European teams a bit nervous, and they have threatened action if it appears that Liberty is showing favoritism to American team Haas Racing. Never mind that for years Formula One has shown a marked favoritism toward the Ferrari team. Like many other huge business operations, Formula One has some structural problems. One is the fact that there are generally only two or three teams whose drivers have a realistic chance of winning. The rest of the teams are filler: exciting but filler. These teams serve as breeding grounds for young drivers on the way up and pasture for old drivers on the way down. In some cases the lesser teams serve as a way for the top teams to lease out their technology, get extra data and recoup some of their outlay. Because of the insane cost of testing and the broad disparities in budget between the top teams and the others, the FIA has sharply restricted testing. If they didn’t, the top teams would be even farther ahead of their lesser brethren. Teams are limited to five engines per car per year. This forces the engine manufacturers to concentrate on reliability. Unlike the old days when the team mechanics would rebuild engines in between practice sessions, modern teams are forbidden to touch the engines. They are too complicated, and most of the teams only lease the engines anyway. They do not own the technology they use. Race driver Santiago De Rivas studies driving technique as Porsche Supercup teams do practice laps. Another problem is that at certain tracks (notably Monaco) it is very difficult to pass. The driver on the pole position at the start of the race has a very good chance of running away from the rest of the pack. Very often the most dramatic passes are the result of pit stops. The rule makers have done their best to try to alleviate this issue through the use of technology designed to make passing easier, but there has been no perfect solution. Another issue is that it is extremely difficult for the track owners to make money on an F1 race. The amount of money demanded by the promoters to host a race makes it very difficult to come out in the black. Despite huge popularity, the British round of the series may be in jeopardy due to this issue. And yet, Formula One is hugely popular worldwide. Current and former drivers are megastars who cannot walk down the street unmolested in many cities of the world. Deceased driver Ayrton Senna is still revered as a demigod in his home country of Brazil years after he was killed in a crash at Imola. Mankind has a sentimental spot in its collective consciousness for racing of every kind. I am sure that from our very earliest history people have been striving to outpace their fellow man. Whether walking, running, racing horses, camels, chariots, bicycles, boats, cars, motorcycles, airplanes and god knows what else, we are magnetically drawn to the racer. We revere and respect them no matter the flaws of the competition. In some ways he (or she) is performing a sacred act. In ancient times, competitors were actually performing a sacred act of worship to the gods. On a sunny weekend in Mexico, the land of Quetzalcoatl, Tlaloc and the Virgin of Guadalupe, we paid tribute to the shining young men while they raced their cars. Let us salute them.